Located in the heart of the South Gloucestershire town, Yate Shopping Centre is an outdoor mall with over one hundred retailers that range from famous high street names such as Tesco Extra, M&S Simply Food, Sports Direct,Peacocks, Next, TK Maxx, Costa Coffee, Starbucks, New Look, M&Co, Argos and Dorothy Perkins, to locally renowned independent stores such as ironmonger Meredith’s and Jeweller Abrahams. A strong community shopping complex, Yate Shopping Centre holds a varied events programme throughout the year that has included a local talent contest, childrens attractions, Christmas events and celebrity visits including Peter Andre, Steps and X Factor finalists. Construction of Yate Shopping Centre began in the 60’s with the mall being opened officially by famous face of the day Patricia Phoenix (who played Elsie Tanner in Coronation Street). The centre has grown and developed ever since into a popular, bustling shopping destination for both local and regional customers. Yate Shopping Centre has seen many developments and changes over the years. In the 90’s glass canopies were installed along the mall, giving the centre a greater standing as an all weather shopping complex. In the 80’s East Walk was developed for the construction of a new Tesco store. Recently, this store has seen a significant investment and has been transformed into a Tesco Extra with110,000 sq ft of retail space, an enhanced customer provision and 24 hour trading. See our development section for more information on the new Tesco Extra. Within walking distance of the centre, there is also a Jobcentre Plus, Citizens Advice Bureau, Library, Leisure Centre as well as the new youth cafe, the Armadillo. The £12 million West Gate Health Centre was opened in 2010 after construction began in 2008. During 2012 four retail units were transformed in to a new JD Wetherspoon named Thorn's Farm, providing an alternative eating and social expereience. The future of Yate Shopping Centre is looking bright too. The building of four new units at the centre has seen M&S and Sports Direct open at Yate Shopping Centre in 2013. The Yate Riverside retail and leisure scheme opened from December 2015 with an exciting mix of retailers, restuarants and a six screen Cineworld. Operators at Yate Riverside include Pets At Home, Next, TK Maxx, Frankie & Bennys, Nandos and Cineworld. Yate Shopping Centre has seen a number of new retailers and eateries open during 2017 including Pandora, The Entertainer Toy Shop, Bolero Lounge, Papa John's Pizza, Julian Charles and The Bay Tree Gift Shop. For more on this exciting investment, see our developments page. Individual shop opening times do vary so please check with your favourite stores before travelling. Tesco Extra operates 24 hours a day throughout the week and 10am to 4pm on Sundays. From grabbing something tasty to eat on the go, catching up with friends over a coffee, refuelling after a hard days shopping or getting the week's groceries in, you'll find plenty of places to eat and drink at Yate Shopping Centre. Yate Shopping Centre understands that it is important to provide facilities that meet customer expectations and therefore new public conveniences have been constructed on West Walk outside of the Westgate Centre. The new facilities opened to customers on the 27th March 2013. Yate Shopping Centre is a single level shopping complex. You can hire a wheel chair free of charge from Yate Shopping Centre. Call 01454 311229 to book or for more information. Shopmobility offers scooter and wheelchair (powered and manual) hire to anyone with limited mobility, to give them the freedom to visit shops and leisure facilities in Yate. Anyone is welcome: young and old, with temporary or permanent disabilities or injuries. You do not need to be registered disabled to use Shopmobility. The service is free to anyone with a South Gloucestershire bus pass, £3 for other users. For a small charge, Shopmobility can provide longer-term hire for those with a temporary disability, for people who staying in the area for a period of time, for people whose own scooter/Powered wheelchair is being repaired or for those considering buying a scooter in the future. They also have scooters that can dismantle and fit into most cars for those wishing to go away on holiday. Shopmobility can deliver a scooter/wheelchair to you at Yate shopping centre bus stop on these days. Long–term hire available subject to availability at small cost. Check here for any current job opportunities at shops and restaurants at Yate Shopping Centre. Yate Shopping Centre has a 24 hour security provision seven days a week with CCTV operating throughout the centre for the comfort and safety of our customers. All of our security officers are fully first aid trained. If you have lost an item at the centre, please contact the security team at 01454 311229. Please note unclaimed items are donated to charity after three months. The meeting point for lost or found children is next to Boswell's Cafe. Please advise the security control room on 01454 311229 immediately upon finding or losing a child. The safety of our customers, visitors and staff is very important to us and as such we ensure that the centre team is trained to a very high standard in emergencies and emergency response, this training includes the use of Defibrillators. If you or someone requires first aid treatment please contact security on 01454 311229 or ask a store to call our team. The owners of Yate Shopping Centre submitted a planning application for a Marks & Spencer Simply Food store in East Walk at the Yate Shopping Centre. The application was for a new unit of combined floorspace at ground and first floor level of 1,678 square metres to sell both food and non-food goods as typically found in such a store. 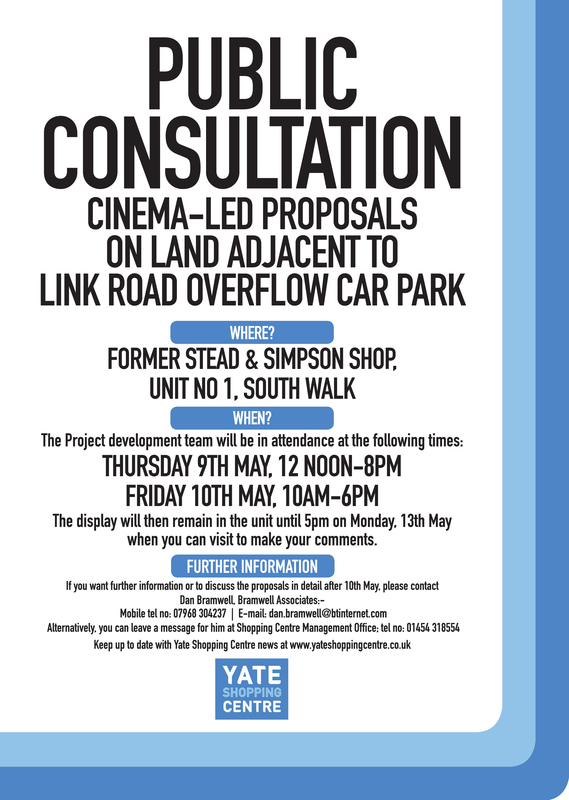 A public consultation was undertaken during April 2013 on proposals to develop land adjacent to Yate’s Link Road overflow car park. Crestbridge Corporate Trustees, owners of the town’s Shopping Centre, are proposing that the site is developed as a leisure quarter with a cinema, restaurants and new retail units. A spokesperson, said: “We have always been aware of the strong feelings to see a cinema in Yate. When we first consulted the public seven years ago, shortly after buying the centre, on the proposals for a new Tesco store and additional retail units in East Walk, the things that topped the public’s wish list then was a new cinema and more high street retail names. 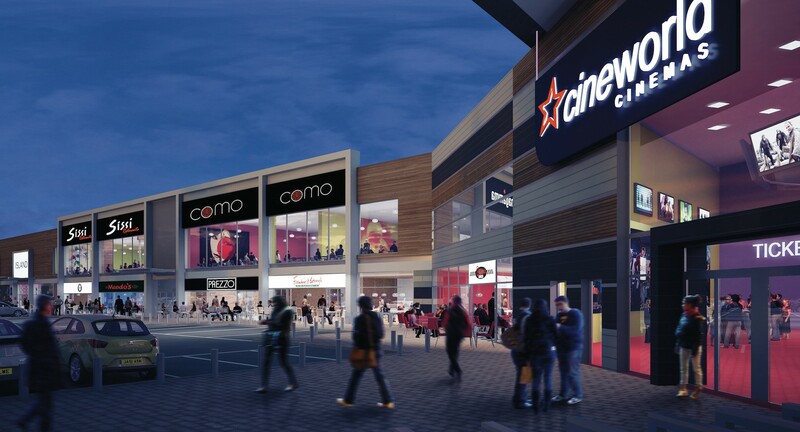 “We have so far secured Marks & Spencer Simply Foods, Sports Direct and Costa Coffee for East Walk, along with strong interest from a national fashion retailer on the final unit, and are now doing our best to deliver a cinema! “Our aim is to create a nightlife venue for Yate that will rival other nearby centres and save people having to drive out of the town for their entertainment. We are proposing a six screen cinema, six restaurants and food outlets of various sizes, and three new retail outlets. It is a combination that will make the project viable and is attractive to the market. We already have operators interested in taking the majority of the space in the development. The proposed development will have easy access to Yate’s new bus station and will see an increase in parking provisions with a total of 360 car parking spaces along with a further 1260 that already exist at the Shopping Centre. The total investment in the project is well in excess of £12 million. It is expected to create over 150 further jobs in the Centre with as many as another 100 jobs during the construction phase. “This latest project will bring our total spend in Yate to over £40 million in the last three years and we are committed to ensuring that Yate Shopping Centre is a 21st Century facility that serves the locality and plays a major role in keeping people in the town. This kind of investment is just unheard of during times of recession, but we believe in the longevity of the Shopping Centre and Town as a whole”. South Gloucestershire Council granted planning permission on the 7th May 2014 for the leisure development. Ecology works have now commenced and the building works are due to commence January 2015 with an expected completion date late 2015. Cineworld is to anchor a major new retail and leisure park in Yate, in the latest phase of development in the South Gloucestershire town. 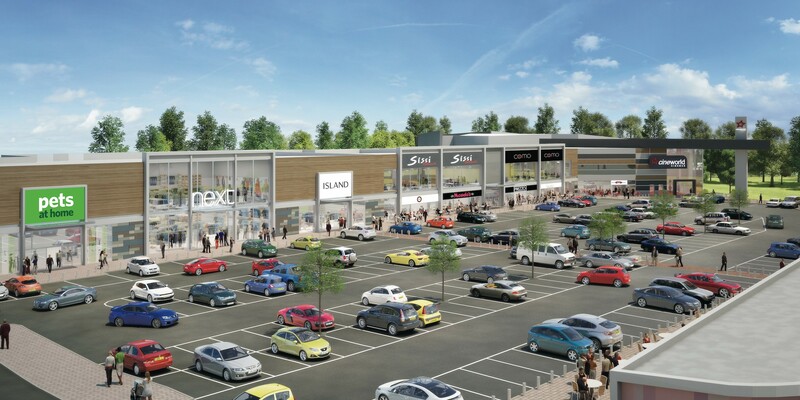 The 98,000 sq ft Yate Riverside scheme will include a six-screen cinema alongside 73,000 sq ft of retail and restaurant space, as well as 360 new free car parking spaces to compliment the existing 1,260 spaces in the adjoining shopping centre. The new phase of development is part of an overall masterplan to transform Yate’s retail and leisure offer. Owner Crestbridge Corporate Trustees completed a 50,000 sq ft extension to the existing 400,000 sq ft shopping centre in 2013, which is fully let to M&S Simply Food, Peacocks, Sports Direct and Costa Coffee. The extension was recognised by the BCSC Gold Awards panel for its design and the way in which it brought a step change to the shopping centre as a whole. Members of South Gloucestershire Council voted to approve the Yate Riverside scheme earlier this year as part of a long-standing drive to enhance Yate’s retail and leisure offer and meet demand in the rapidly growing town, which has 3,500 new homes planned. A spokesperson for Crestbridge said that Yate Riverside would attract more national operators to the town and transform the town’s night-time economy to firmly put Yate onto the map. “At the moment Yate lacks the food and leisure offer to reflect its significant affluent catchment and major growth plans, which the new restaurants and cinema will address. 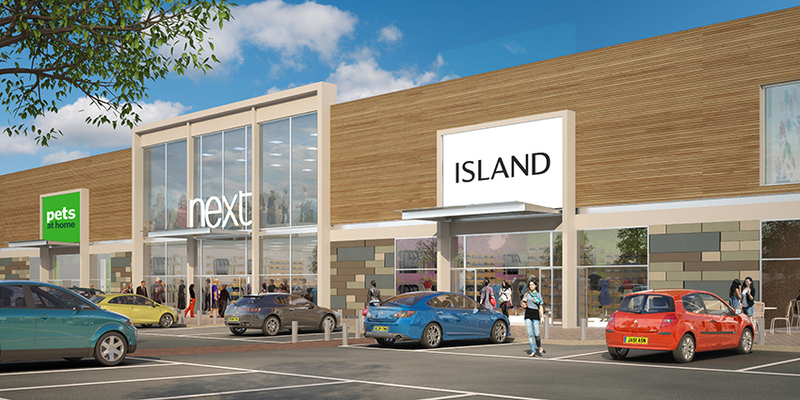 The new retail and leisure development has been designed by Haskolls and will be built on land adjoining the already highly successful shopping centre, which boasts a new 110,000 sq ft Tesco Extra which opened in 2011 and a raft of other national and independent retailers. Footfall in the town centre is currently up 6% year on year with over 12 million customers per annum. Construction will start on site during the first quarter of 2015, with further occupier announcements anticipated before the end of 2014. Further plans to improve the overall scheme include proposals to reconfigure the centre’s West Walk to provide 15,000 sq ft adjacent to one of the town’s surface car parks and next to the current MacDonalds. Leasing agents for the scheme are Savills. Haskolls is the architect for the development and the Development Manager is Hanover Cube. GVA advised on planning. To find out more about Yate Shopping Centre and the opportunities letting a unit at the centre could present, you can download our letting brochure here and download our leasing plan here. Watch our letting video here. Cineworld has anchored a major new retail and leisure park in Yate, in the latest phase of development in the South Gloucestershire town. The 98,000 sq ft Yate Riverside scheme includes a six-screen cinema alongside 73,000 sq ft of retail and restaurant space, as well as 360 new free car parking spaces to compliment the existing 1,260 spaces in the adjoining shopping centre. The new phase of development was part of an overall masterplan to transform Yate’s retail and leisure offer. Owner Crestbridge Corporate Trust completed a 50,000 sq ft extension to the existing 400,000 sq ft shopping centre in 2013, which is fully let to M&S Simply Food, Peacocks, Sports Direct and Costa Coffee. The development of the Yate Riverside retail & leisure complx completed during September 2015. Operators that have opened to date include Next, TK Maxx, Pets At Home, Nandos, Prezzo and Frankie & Bennys & Esquires Coffee.